Cenex has announced dates for LCV2017, which will mark the 10th anniversary of the Low Carbon Vehicle event. Taking place at Millbrook Proving Ground on 6-7 September, Cenex-LCV2017 will look to build on the successes of this year’s event, which recorded over 3,100 attendees, bringing a 10% total increase in visitor and exhibitor attendance compared with LCV2015. 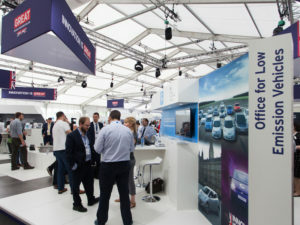 Over the past 10 years, the LCV Event has attracted UK and international visitors, distinguished speakers, cutting-edge vehicle technology, notable vehicles available for ride & drives, and an extensive seminar programme which has provided a platform for educating and agenda setting. In 2014 the LCV Networking Dinner was also added. To keep up to date with Cenex’s 10th Low Carbon Vehicle event, LCV2017, visit www.cenex-lcv.co.uk, or follow @LCV_event on Twitter.